James graduated with an honours degree in Medical Sciences (neuroscience) from the University of Exeter Medical School. Throughout his time studying medical sciences James developed a particular interest in the field of neuroscience with specific focus on the pathology of neurodegenerative disorders. In his final year, James continued to develop his interest in neurodegenerative disorders through completing a combined neurobiology-endocrinology project. The project aimed to investigate the effects of glucose metabolism on cofilin rod formation in glial and pancreatic beta cells, a known pathological hallmark of Alzheimer’s disease. 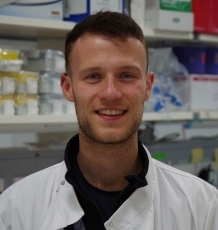 James is currently performing research into the pathology of Amyotrophic Lateral Sclerosis (ALS), a fatal neurodegenerative disease that affects motor neurons i.e. the nerve cells that carry signals from the brain and spinal cord to the muscles. At present, James is investigating how transcriptional networks are perturbed due to a repeat expansion mutation present in the C9ORF72 gene found in ALS patients. James’ work aims to underpin what aspect of ALS pathology this mutation may be driving and to devise strategies to either correct this mutation or block its pathological effects. James has a wide range of academic interests with primary focus on neurodegenerative disorders (Alzheimer’s, Parkinson’s, ALS) and the pathology of diabetes. Investigating the disruption of transcriptional homeostatic networks in driving motor neuron specific degeneration in Amyotrophic Lateral Sclerosis. Postgraduate Teaching Assistant: leading seminars and workshops, delivering lectures, demonstrating in the laboratory, and designing course content.